Alaska is a very beautiful place from the rivers down below, to the mountains in the sky. At first, the first word that would pop up in my mind would be snow, but now I know there is a lot more things another than snow. There are mountains, hill, rivers, forests, etc. On the top of the mountains in Alaska, there is a blanket of snow, because if you go higher up the mountains the temperature drops. 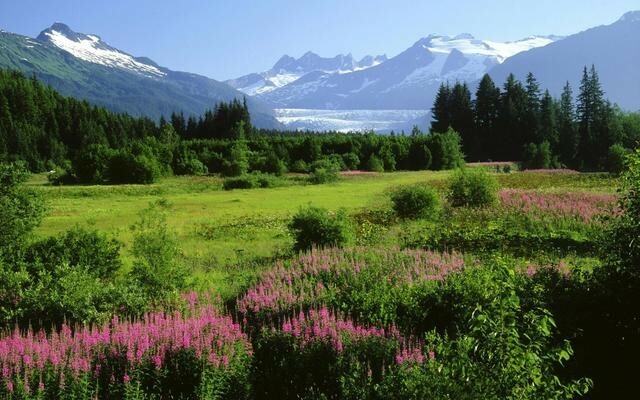 In Alaska, there are many different species of flowers. Overall the landscape in Alaska is amazing and beautiful. Other than the landscape, there are other amazing things too, such as the culture and language. The languages that Alaskans speak are about four; Tlingit, Inupiaq, Siberian Yupik, and lastly English. In Alaska, the culture is very interesting. Alaskans eat fish and meat, because there are a large variety of them. Therefore, they don't depend on crops. Their favorite sport is Dog mushing, along with skiing, snowboarding, and kayaking. Alaska also has holidays. First, they have the Steward's Day. This is the day where they celebrate Alaska's purchase from Russia. The other holiday that they have is the Alaska Day. 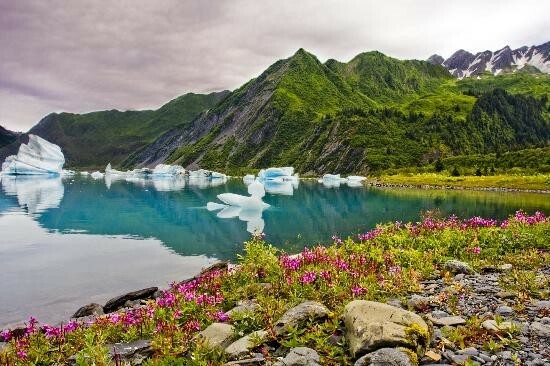 The Alaska Day is an anniversary for the transfer of Alaska's land. Alaska would be a good representation of Middle-Earth, because Alaska has many similar landscapes with the Hobbit. In the Hobbit, there were mountains with snow on the top of the mountain that Bilbo and his "friends" had to walk through. 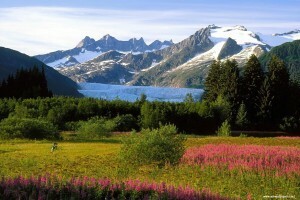 In Alaska, there are many mountains where there are snow on the top of the mountain. Also, there were forests in the Hobbit where Bilbo stayed and slept. I never knew, but there are many forest in Alaska, also. "Dark and drear it looked, though there were patches of sunlight on its brown sides, and behind its shoulders the tips of snow-peaks gleamed." This is what Bilbo said while looking at the Misty Mountains. This landscape is a picture of mountains, hills and a body of water. On this body of water, glaciers float around. There are also many rocks and flowers on the land. This landscape best represents Middle-Earth, because there are many mountains with snow, like the ones in the Hobbit. Also there are many hills (like the ones showing in the picture) in the Hobbit book also. This landscape is a picture of a valley seen from above. Also at the very bottom, you can see a river. This valley represents Middle-Earth well, because in the beginning, Bilbo and the others saw a valley down below them. They saw the valley as a zig-zag path into Rivendell. Along with the valley down below them, they also heard the voice of the hurrying water. 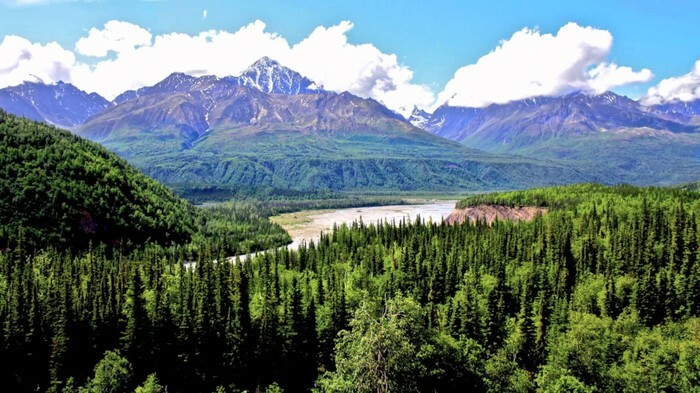 This landscape is a picture of a forest in Alaska. Next to the forest, you can see a river that streaming down right next to the forest. Also if you look farther ahead, you can see the mountains. This landscape represents Middle-Earth, because the forest is where the adventure began. Everyone went into the forest and started their adventure, but then rain started to pour down on them. The forest was the start of this whole adventure. I believe that Alaska is the best region to represent Middle-Earth, because there are many similarities between the two. The one main reason I believe that Alaska is the best region is because Alaska has the snowy mountains Middle-Earth does. To be more specific, they both have the snow on the top part of the mountain. Also in Middle-Earth, there are hills where the Hobbit-hole is. Alaska has many hills, so they can build the Hobbit-holes. Almost all the landscape that is in Middle-Earth is all in Alaska; such as valleys, forests, rivers, hills, mountains, and many more. 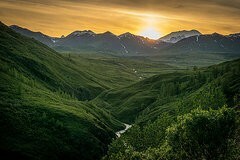 Another reason I think Alaska is the best region to represent Middle-Earth is because Alaska has very beautiful scenery. Of course the landscapes are important for Middle-Earth, but the scenery is also an important factor. The mountains in Alaska are absolutely beautiful, along with the valleys. This is why I think that Alaska is the best region to represent Middle-Earth. Alaska is a very beautiful place. The mountains, hills, and the valleys are just amazing to see. Alaska is the Middle-Earth to me, because Alaska consists of many beautiful landforms and it is almost the same as the Middle-Earth in the Hobbit. Also, I really thought their culture and language was cool. Overall, Alaska is a wonderful place all seasons, and I really think that Alaska is really suited to be Middle-Earth. Alaska is a perfectly suited to be Middle-Earth, because of the beautiful landscape.